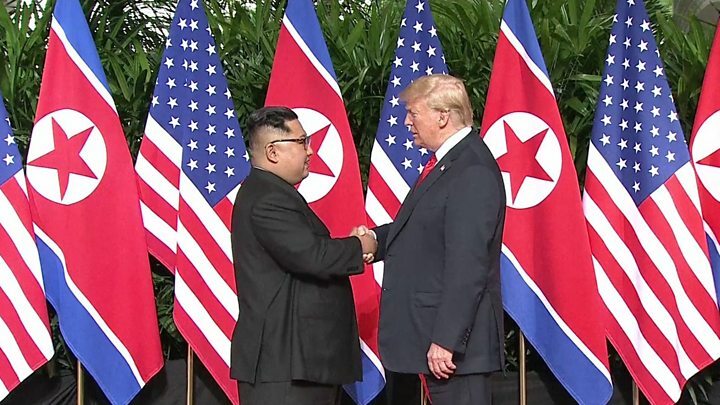 The Philippines Chapter of the International League of Peoples’ Struggle (ILPS-Phils) welcomes the first DPRK-US Summit held on June 12, 2018 in Singapore between Kim Jong Un, chairman of the Workers’ Party of Korea and the State Affairs Commission of the Democratic People’s Republic of Korea, and United States President Donald J. Trump. The Joint Agreement signed by both parties caps a series of historic steps towards achieving peace in the Korean Peninsula and the region. The Summit was preceded by the meeting between Kim Jong Un and Chinese President Xi Jin Ping in March followed by the North and South Korea talks held in April for the Winter Games and June of this year. After more than a decade, military talks between North and South have resumed. Due recognition should be given to all parties who have set the groundwork and helped in the realisation of this significant Summit. Amid the multipolar rivalries of imperialist powers in the world today, the U.S. in its post-primacy period could only trail behind those diplomatic initiatives of the DPRK. It is now time for the U.S. to walk the talk. A formal peace treaty with Korea is imperative. Without it, the U.S. is still at war in Korea. The armistice in place after the 1950-53 U.S. Korean War should be replaced with a permanent peace treaty. A divided Korea is a creation of the U.S. and should be unmade. The great sufferings of the Korean people must end. Economic sanctions should be lifted. only a temporary relief for the Korean people. The U.S. must leave the Korean Peninsula and the region for good. There is much to see in the implementation of the Joint Statement. Former CIA head, now US State Secretary, Mike Pompeo, can have many tricks up his sleeves as he meets with his Korean counterpart for further talks. We shall remain vigilant against peace saboteurs. The U.S., despite its decline, is stills seeking imperialist world hegemony and control. We must continue to resist imperialism and all reaction until genuine peace and stability is secured. We look forward to building peace in the Korean Peninsula and the entire world breaking free from the stranglehold of imperialism and securing freedom, democracy, socialism and progress for all.